Well it’s a shame that this happened and I am sure there are people who are still lingering in disappointment since hearing that KaBoom Fireworks will not be displayed along the Navesink River in Red Bank this year. It broke my heart when I saw it come across the wire. For 50 continuous years, a fun family time of food, entertainment, catching up with friends, and most importantly fireworks was celebrated in the 2.2 square miles of Central New Jersey called Red Bank. It was the party of all parties, a display of lights flashing across the night sky bedazzling spectators while synchronized to music played on Q104.3, but this year the night sky will be only illuminated from the light of the stars swirling around our universe. I will need to rethink my plans for this year. After all, there is still Long Branch. They have Oceanfest along the boardwalk and promenade on Ocean Avenue. Oceanfest lasts all day long and will tire out even the most energetic child. Farewell KaBoom, maybe next year or possibly the year after, but I truly hope to see you again. Jersey Shore Restaurant Week is coming back April 13-22, 2012! Participating restaurants are gearing up to dish out the deliciousness you are craving. The participating restaurants will offer a three course menu for $20.12 or $30.12 per meal. You will be able to choose from three appetizers, three entrees and three desserts. There is “shore” to be something for everyone. So far some great restaurants are on board to serve up their dinner specialties. In Red Bank, which is right around the corner from the Middletown Comfort Inn; Basil T’s, Pazzo and Temple Gourmet Chinese will be available for your dining pleasure. If you go a bit to the east of us in Rumson, you can enjoy the scrumptious meals served at David Burke Fromagerie, Salt Creek Grille, and Undici Taverna Rustica. There are plenty more restaurants to choose from along the shore. I dare you to not cook all that week! Did you miss Restaurant Week in the past because you couldn’t make it out for dinner? Great News, this year select restaurants will offer Lunch Menus during this special week! So mark your calendars, or iPhones or Blackberries – don’t miss out! Okay the winter season is upon us. So far we have been spared the brutal forces of Mother Nature (insert big smiley face here), but winter is not over yet. It is always best to have a plan set up in advance, especially when you have four legged family members living with you. Below is a guide to what you should consider. The Comfort Inn Middletown is pet friendly all year round. If you evacuate your home, DO NOT LEAVE YOUR PETS BEHIND! Pets most likely cannot survive on their own; and if by some remote chance they do, you may not be able to find them when you return. Identifying shelter. For public health reasons, many emergency shelters cannot accept pets. Find out which motels and hotels in the area you plan to evacuate to allow pets — well in advance of needing them. There are also a number of guides that list hotels/motels that permit pets and could serve as a starting point. Include your local animal shelter’s number in your list of emergency numbers — they might be able to provide information concerning pets during a disaster. Take pet food, bottled water, medications, veterinary records, cat litter/pan, can opener, food dishes, first aid kit and other supplies with you in case they’re not available later. While the sun is still shining, consider packing a “pet survival” kit which could be easily deployed if disaster hits. Make sure identification tags are up to date and securely fastened to your pet’s collar. If possible, attach the address and/or phone number of your evacuation site. If your pet gets lost, his tag is his ticket home. Make sure you have a current photo of your pet for identification purposes. Call your local emergency management office, animal shelter, or animal control office to get advice and information. If you have no alternative but to leave your pet at home, there are some precautions you must take, but remember that leaving your pet at home alone can place your animal in great danger! Confine your pet to a safe area inside — NEVER leave your pet chained outside! Leave them loose inside your home with food and plenty of water. Remove the toilet tank lid, raise the seat and brace the bathroom door open so they can drink. Place a notice outside in a visible area, advising what pets are in the house and where they are located. Provide a phone number where you or a contact can be reached as well as the name and number of your vet. The EMACC Educational Foundation was established to assist students (both full and part time) who have worked very hard to enrich their future through higher education. The foundation grants scholarships each year. In 2011, the Educational Foundation granted an incredible 11 scholarships totaling $17,500.00 – it was through your contributions and the diligence of the Foundation Committee that this was even possible! EMACC is holding a SUPER 50/50 where the proceeds will benefit this wonderful foundation. You can buy a book of 5 tickets for $100.00 or you can purchase single tickets for $20.00 each. This is a definite win-win situation! You might be the winner of a couple thousand dollars AND your act of kindness by purchasing a ticket will help a determined student in need. You can find more information about EMACC and the Foundation by visiting www.emacc.org. The drawing will be held at 7pm on January 18, 2012 during the EMACC Annual Meeting being held at the Shadowbrook (1 Obre Place, Shrewsbury). Good Luck! Free Stuff and Elvis.. Can it get any better than this? Stepping further back in time – January 20th at 8pm Count Basie Theatre will present The Elvis Birthday Bash. This popular event is back for its 8th year. Tickets start at $19.50 and can be purchased online, at the box office or over the phone. Slip on a pair of your favorite blue suede shoes and celebrate the memorizing career of “The King”. Visit http://www.countbasietheatre.org/calendar/show/show.asp?id=43247064 to reserve your seats. Count Basie Theatre is only 3 miles away from us at the Comfort Inn Middletown. Reserve a room for the nights of January 10th or 20th and enjoy a discount at our fine hotel by mentioning rate code LCBTH. Our friendly staff can be reached at 732-671-3400. 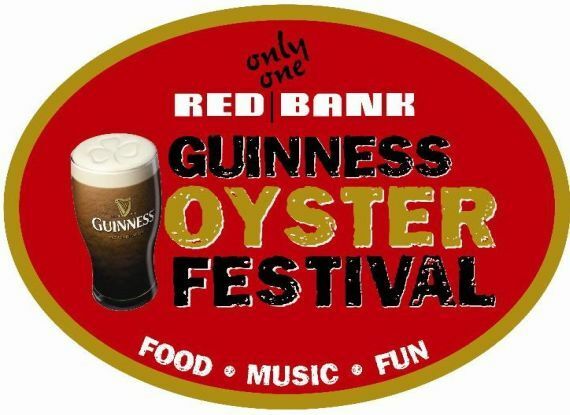 The 2nd annual Red Bank Guinness Oyster Fest will be held Sunday (Funday), September 25, 2011 from 12:00pm to 7:00pm in the White Street Parking Lot in Red Bank, NJ. It will happen rain or shine, with or without you (pun intended) with musical headliner 2U the World’s Second Best U2 Show. There will be two stages set up with multiple bands playing a mix of Irish Music, blues, funk and rock n’ roll. There will be 25 of Red Bank’s best restaurants serving up their favorite menu items festival style. Admission fees benefit the Jane H. Booker Cancer Center at Riverview, the Cancer Institute of NJ Foundation and RiverCenter. Be prepared for tons of oysters, Guinness, and lighter beers and wine will be available too. Hope to see you there! 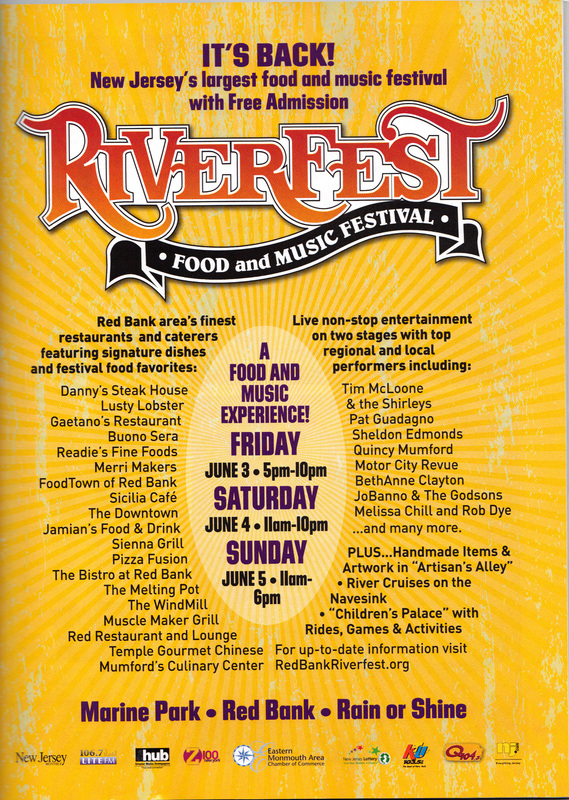 River Fest Food and Music Festival returns to Red Bank June 3-5, 2011. It will be held in Marine Park and is a full weekend affair with plenty of food and entertainment. River Fest happens rain or shine. Red Bank area restaurant will have their signature dishes and festival food favorites on display. Two stages will feature non-stop entertainment from performers you are bound to have heard of. Artisan’s Alley will feature handmade items and artwork, Navesink River cruises and Rides, Games and activities for kids make River Fest an event for everyone. The picture above is a straight up scan of the ad featured in the May 2011 issue of New Jersey Monthly. The Comfort Inn Middletown-Red Bank is just a few short miles from Marine Park so if you’re looking for a place to stay or put your friends up, you can find us here.